SAN JOSÉ, CA— Presented by Guggenheim Entertainment, Inc. presents, at 3BELOW Theaters & Lounge, “SONDHEIM ON SONDHEIM” is a musical review of the songs written by SONDHEIM from his many shows, spiked with taped interviews with SONDHEIM in which he reveals bits and pieces of his life. 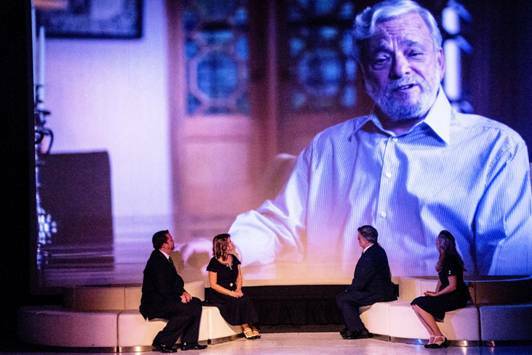 In the musical SONDHEIM on SONDHEIM, the lyricist/composer known as “The Father of Modern Music,” is introduced to the audience in two ways: The first way, as a video projection (created and designed by PETER FLAHERTY) in which SONDHEIM addresses the audience. Using his own words. He reveals to us his past, as a confused “only child” in a family of fighting parents, where his mother had told him over and over again how much physical harm his midnight’s “difficult” birth had caused her. Her revelation, conditioned the child to feel guilty for causing his mother harm. More painful for him was to hear from his father, years later, that his mother’s story was a lie, and that he had been born in a normal birth at 9:A.M. After his parents divorced, the seven year old boy was placed with the family of Playwright/lyricist OSCAR HAMMERSTEIN who served as his surrogated parents. Growing up with the musical family, he learned to write songs’ lyrics and to play the piano. The video, also provides the audience glances of SONDHEIM’s life as a man. We listen to his answers, in some of his many televised interviews, and walk beside him through the interior of his house,observing him as he sharpens a pencil to scribble a lyric on a lined yellow pad, sitting on the bench of his Grand piano. We also learned, watching that video, that his most cherished possession is a photograph of OSCAR HAMMERSTEIN in which he wrote: “To Steven, my student and teacher.” The words proving to him, that through all those year they lived together as father and son, both HAMMERSTEIN and him learned something from each other. The second way the musical teach us something about SONDHEIM is through his music, and specially the lyrics of his songs. Both are presented to the audience as a live review with each one of his songs being performed on the stage. The performers are four women and four men, who are trained singers, good dancers, and know how to act. L to R back row: THERESA ANN SWAIN, HAYLEY LOVGREN, JIM AMBLER, and AMY BOUCHARD in the first row: JEREMY DREAMER, SUSAN GUNDUNAS, STEPHEN GUGGENHAIM, AND MARTIN ROJAS DIETRICH. All are professional, have well trained voices, excellent timbres of voice and sing their songs with excellent enunciation. They sing alone, in duets, in quartets or as a choir. Each singer “interpreting” his/her song as the song was originally performed on the show they were written for. And because each singer has a different timbre of voice, when their eight voices blend in the choruses they sound lovely. For SONDHEIM’s fans, the musical allows them to listen to 48 songs from his musicals: “SUNDAY IN THE PARK WITH GEORGE” “INTO THE WOODS,” “PASION” “ FOLLIES,” “MERRILY WE ROLL ALONG” COMPANY” A “FUNNY THING HAPPENED IN THE WAY TO THE CHOIR” and others. The show is highly entertaining because since each song was originally directed by SONDHEIM the singers’s interpretations are excellent. On the show’s opening night GUNDUNAS put a lot of feeling in each of her songs. BOUCHARD sang hers in an operatic Soprano tone. 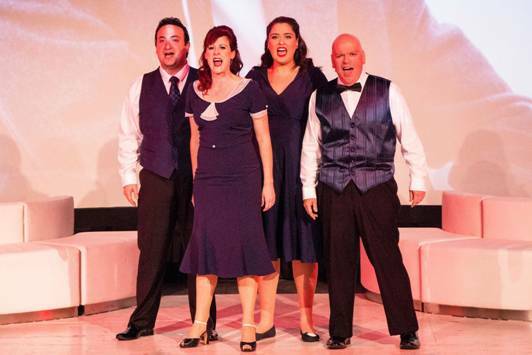 The quartet of Something is Coming (from WEST SITE STORY where SONDHEIM wrote the lyrics) sang by HAYLEY LOGREN, THERESA ANNE SWAIN, MARTIN ROJAS DIETRICH and JEREMY KREAMER got a lot of applause. and so did STEPHEN GUGGENHEIM for his operatic rendition of Epiphany (from SWEENEY TODD) whish was wonderful. Theater 1 Screen an intimate 87 seat theater for your favorite Revival, Retro, Repertory and Classic Films Anniversary Screenings, Marathons and film festivals, double features, Saturday Morning cartoons, Independent and foreign Movies. Theatre 2.ComedySports. Home to San Jose’s longest running show. This theatre will allow us to enjoy weekly live comedy events and take classes in improvisation lead by Silicon Valley’s best improve educators. Theatre 3. Stage & Screen. 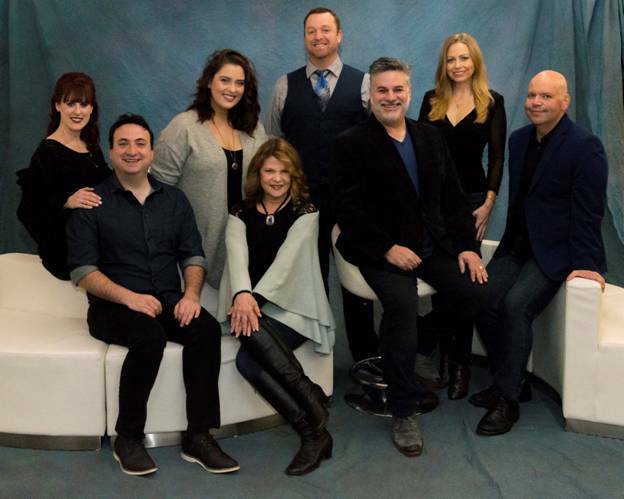 Accommodating 350 guests for professional live Musical Theatre, family Holiday Musicals, Sing-along and Quote-Along Events, Cinequest Film & VR Festival, Chamber Opera, Cabaret Nights, Live Music, and Concerts. Previously known as Camera 3,.but now remodeled from top to bottom, with comfortable chairs, new lighting, acoustic walls new flooring, furniture, remodeled bathrooms and completely re-painted the theatres looks and smell like new. Also renewed were the venue safety, the sound, light projections and all security measures After visiting one, we could easily guess that being the most modern theaters in the city, and the only building offering the audience three completely different venues of entertainment, the 3 BELOW THEATRERS & LOUNGE will soon become the theatres in everybody’s choice.